Microbe Brew: For your soil to drink! We'll start brewing again in spring 2019! The soils in Boulder County suffer from extremely low levels of microbial activity, which is the key difference between “soil” and just plain old dirt. 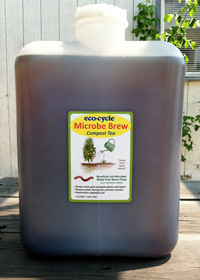 Our Microbe Brew Compost tea is the best natural soil amendment on the planet for our local soils. That’s a big claim, but it’s true because the tea is brimming with millions of living microbes! > Where can I buy Microbe Brew and how much does it cost? > What is Microbe Brew? > Why is Microbe Brew so good for my plants and lawn? > How do you use it? > Why is Eco-Cycle making Microbe Brew? Watch our short video to learn about the enormous benefits of Microbe Brew! Where do I get Microbe Brew? Microbe Brew is available at CHaRM Facility at 6400 Arapahoe from spring to fall. We have paused brewing until spring 2019. Because the Microbe Brew is alive, it is very important to use it within 24 hours UNLESS you are able to keep it refrigerated, in which case it may be used within 7 days of the brew date stamped on the back label. Microbe Brew is available during the growing season. Call for availability (303.444.6634). Interested in large quantities? 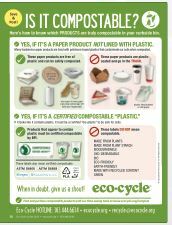 Contact Eco-Cycle at recycle(at)ecocycle.org for more information. 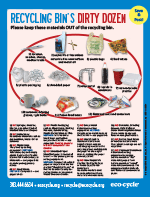 *A refundable container deposit of $.50 will be charged upon purchase, $5 for five-gallon container. 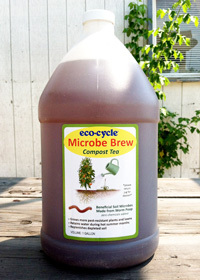 What is Microbe Brew compost tea? Eco-Cycle’s Microbe Brew is a living soil amendment that instantly goes to work balancing your soil and feeding your plants by releasing the minerals and nutrients already present in your soil. It requires no prep work—just sprinkle it over your lawn and garden beds using a standard watering can and then water it in until your soil is thoroughly moistened. 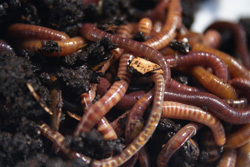 We start with worm composting, a system that converts food waste and other organic material into the most useful soil amendment on the planet with the help of Redworms (Eisenia fetida). As organic material passes through the gut of the worm, it is converted to castings—stable little balls of nutrients readily available for uptake by plant roots. The castings are then brewed in highly oxygenated water under conditions that are optimal for the beneficial micro-organisms present in the castings to reproduce rapidly. When finished, Microbe Brew tea is a liquid teeming with living microbes and beneficial plant-growth compounds. How is Microbe Brew beneficial? Most of our local soils in Boulder County have very low levels of microbial activity due to pesticide and fungicide use, depletion, or perhaps they have never been improved from their native state. When compost tea is applied to your yard, garden, or houseplants, the microbes give a jump-start to your soil and plants by eating minerals and organic matter and making them available to plant roots. Every person who uses the worm tea or castings will be contributing towards building much-needed, healthy soil. Rather than going to the landfill where they contribute to global warming, food scraps return to the soil they came from and produce new food crops. 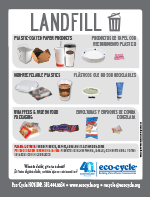 It's cyclical, it's natural, it's Zero Waste. And the results have been impressive! 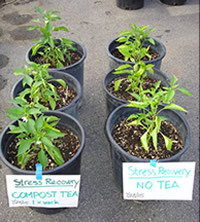 In our houseplant trial, the tea-fed plants are using 1/4 the water because the microbes help maintain moisture. If applied to your lawn, this could mean dollar savings for your water bill. 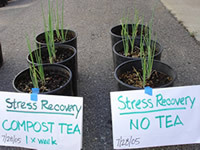 Additionally, all the plants receiving the tea are clearly hardier, larger, and the resistance to pests has been phenomenal. 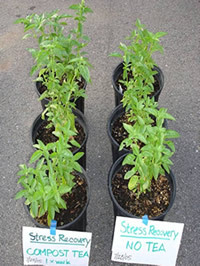 In a greenhouse seedling trial in 2004, basil that received only water was thoroughly munched by baby grasshoppers, while the basil right next to it that was watered with tea once per week was virtually untouched. Plan ahead – it is important that you apply the tea the SAME DAY that you purchase it because the tea will become less oxygenated over time. Remember, the tea is alive! Apply once per week for at least eight weeks… less is OK, and more is better. Apply the tea by pouring directly on the soil, or, apply with as a spray. Use full strength for indoor and garden plants, or dilute 50/50 to cover a larger area like a lawn, (including use with the type of sprayer that attaches to the end of your hose). For larger areas like lawns, use water on the area either immediately before or after so the microbes can easily move down into the soil. 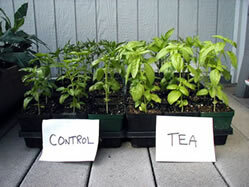 Potted plants are small enough that you can water to saturation with the tea itself or a tea dilution. To use compost tea as a foliar (spray on the leaves), apply in the morning or early evening to limit the damaging effects of UV rays on the microorganisms. Re-use the containers we give you the tea in!! Bring them back for a refill and we’ll give you a discount! Potted plants really love compost tea! They often struggle to grow because they are left in the same sterile planting mix for many years. Give them an immediate boost of life! Dilution at 1:1 is recommended for cacti and succulents. RECOMMENDED: apply compost tea rather than water once per week for as long as you like the results. Regular applications of compost tea throughout the growing season can improve tilth and aeration of depleted or unimproved soils. Plants in garden soil can benefit from direct soil application or foliar spraying at critical growing points such as the vigorous growth stage in early summer, flowering, and fruit set. This effect can be enhanced with periodic amendment of the soil with solid organic matter such as compost. Soak the ground with a watering can as they break from dormancy in the spring as well as during vigorous early summer growth, flowering, and fruit set. Grass can be sprayed with tea, either full strength or diluted, using a pump sprayer or a hose-end sprayer. Best times for application are as the grass starts to green up in the spring and once a month throughout the growing season. Why is Eco-Cycle making Microbe Brew? 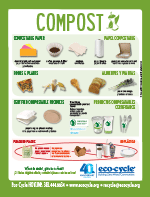 As much as half of the waste stream consists of food waste, yard waste and other organic material that could be composted. When buried in a landfill, organic material causes ground water contamination and contributes to global warming through the generation of methane. In contrast, when composted, food waste and other organics become a valuable soil amendment that can rejuvenate our badly depleted local soils. 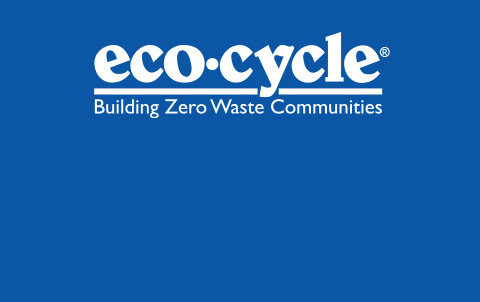 That’s why Eco-Cycle now has a commercial organic waste collection program for businesses and institutions in the Boulder area, serving University of Colorado cafeterias, Whole Foods Market, and the Boulder Farmers’ Market, to name a few. The material we collect is currently going to a regional composter. In the future, Eco-Cycle plans to build a local compost site, so we can make compost products that can be used right here on our local soils. Try Microbe Brew on your own garden and lawns and learn for yourself the powerful benefits of organic waste!